* Admittedly, this is a rhetorical question. Feel free to share your expansion pack name in the comments though. 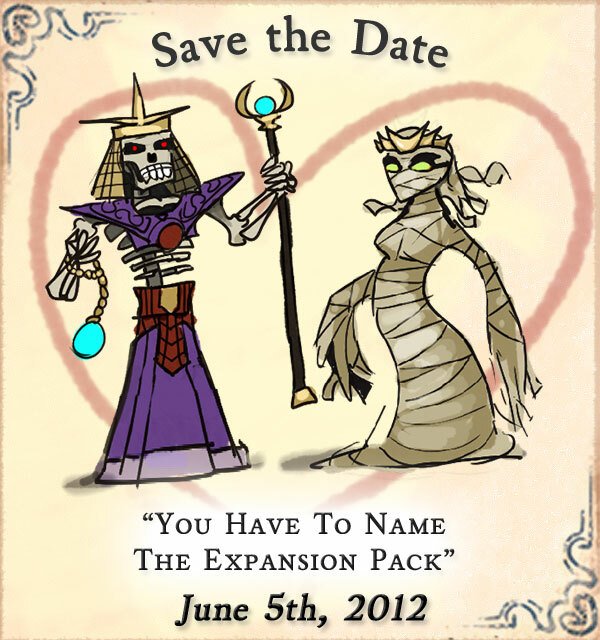 To repeat: You Have To Name The Expansion Pack goes live tomorrow! … and if you’re on Steam, so does the Dungeons of Dredmor Steam Workshop. Let us take this moment to review the features during this super-fun review! 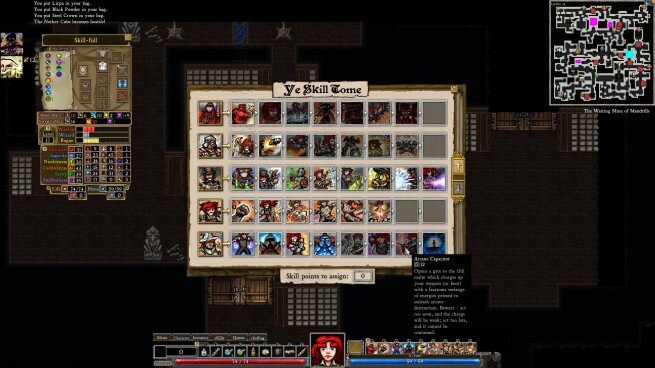 Gaslamp Games takes no responsibility for conniptions caused by experience of super-fun. 4 new skill-lines: Defend the queen with your steam-powered mechanical might as the Clockwork Knight, discover and utilize uniformly dangerous devices as the Rogue Scientist, use rocks to kill people the way nature intended as the Battle Geologist, and be a wizard that really wishes they were a warrior, with the skill that features one of the most ridiculously over-scripted spells in the game thus far, with Warlockery. So I heard you like skills. It’s not quite as soon as we originally expected, but you can’t rush these sorts of things. A free DLC pack is like a relationship – it’s, um … this analogy is going nowhere. But if you really can’t wait, feel free to join in on the ongoing patch and DLC beta through our IRC channel. As with everything we do, we're completely serious about the name. Steam Workshop; mod integration with Steam! We’re turning it on! It’s Steamy! Warlockery, the wizard skill for wizards who would rather by warriors, by the utterly mad Essence — he wrote over 500 lines of xml for one spell. A mess of twisty little rooms, all different, created by the deranged architect our mortal speech renders “Bergstrom“; The geometry is all wrong. And to inhabit the renovated Dungeons of Dredmor we’ve summoned a pack of new monster variations dug up by one FaxCelestis, from the existentially troubling Poorly Cloned Hero to the lofty Diggle Rocketeer. Naturally there are some new items and other such nonsense happening which you’ll have to discover on your own. 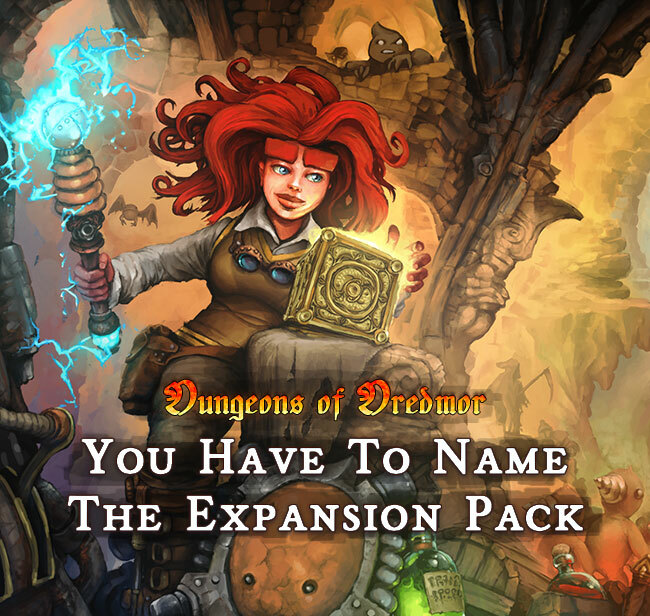 You Have To Name The Expansion Pack for Dungeons of Dredmor will be released very soon — We just need to do a couple rounds of testing and hook up all the Steam Workshop internet-pipes. If you would like to participate in the beta have a wander through our IRC channel. Hi folks! I haven’t written one of these in a while. We’ve been busy with some… really exciting stuff related to modding that we should be able to announce soon. But in the meantime I wanted to showcase two excellent modders’ works, lccorp2 and FaxCelestis. Hi everyone! The format for this week’s spotlight is a little different because I wanted to showcase a very proficient modder, Essence. He’s had it a long time coming, namely for his Essential DoD 1 and 2 mods which add 6 different skills to the game. I will describe each of them briefly since there would be way too much to talk about for one post. If you want the details of every ability I suggest you go to Dredmorpedia, all six are featured there. Bushido is probably the most Warrior-oriented of the skills. It’s designed to help melee characters survive the later levels and as such, it’s all about defensive buffs and self-healing. Here you even get some stackable buffs when getting hit, like Into The Jaws of Death, which stacks all resistances 66% of the time when you get hit. Runecaster is a wizard skill that combines crafting with spell casting. You create runes out of mana, which you then combine with the n-Dimensional lathe to create runewords. These runewords are throwing weapons that cast a spell when hitting enemies/the ground.